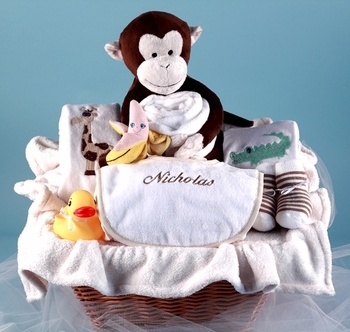 This unique and fun safari themed design is one of our top selling baby baskets for boys and girls! A cute plush monkey and all his pals are terrific cuddly friends to play with and take along on a make believe safari! Loaded with toys, a blanket and other infant essentials, the thick cotton terry bib also comes personalized with the baby's name for that extra personal touch!